It’s perhaps the most overlooked area of the building envelope. Builders and designers who always specify waterproofing for below-grade walls often leave the horizontal slab unprotected. But that seemingly impervious concrete slab under your feet may be letting a tremendous amount of moisture into the building. That moisture—in liquid or vapor form—does a tremendous amount of damage. It can ruin flooring systems, increase heating costs, and encourage the growth of mold and fungus, which creates a series of health and liability issues. It can also cause rust, stains, and odors. Underslab barriers are easy to install. Simply unroll, tape seams, place rebar and pour concrete. The problem is that, without a vapor barrier, air pressure can force moisture and soil gasses through the slab into a home or building. In some instances, methane and radon levels in unprotected basements have risen high enough to be fatal. The solution is fairly straightforward. A properly installed membrane, between the ground and the concrete slab, can eliminate nearly all infiltration. Liquid water is easier to block than water vapor. That means that not all materials that are waterproof are vapor proof, but vapor proof membranes are inherently waterproof. 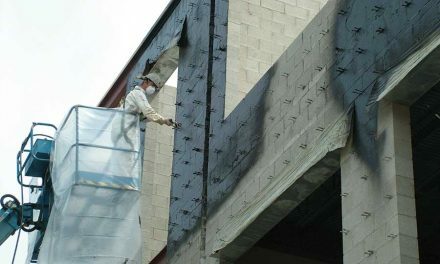 Some contractors and organizations differentiate between vapor retarders and vaporproof barriers. The American Concrete Institute (ACI) for example, defines a vapor retarder as having a permeability rating of less than 0.3. Vapor barriers have a rating of 0.3 or higher. The American Society for Testing Materials (ASTM), on the other hand, uses the terms interchangeably. This article will use the terms interchangeably. 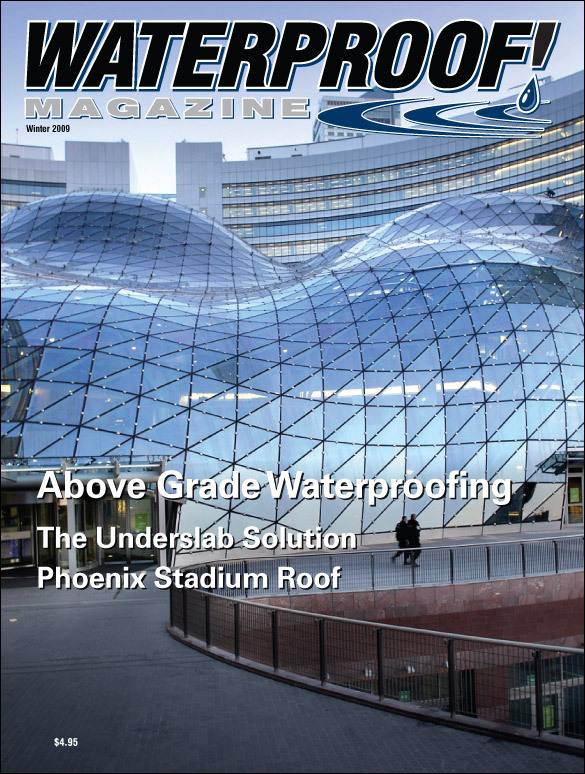 However, specifiers should note that products with higher perm ratings always outperform lower-rated materials. Moisture gets on top of the slab in four different ways. Hydrostatic pressure: Just as groundwater can be forced through basement walls by the weight of the water on top of it, moisture can be forced up through the floor slab by hydrostatic pressure. This is especially problematic if the floor is cracked. Capillary Action: If the ground beneath the slab is saturated, moisture can wick up to the top of the slab. It’s caused by pores in the concrete and the surface tension of the water. Vapor Migration: Water vapor, like all gasses, seeks to diffuse itself evenly through space. So unless a vapor barrier blocks its path, moisture will naturally move from the high humidity area under the slab to the low humidity environment inside. The amount of moisture that can come into a building through vapor migration is astounding. According to Len Anastasi at Lennel Specialties Corporation, most of the United States has an underslab vapor pressure of 15 lbs. per sq. ft. That means for a standard 4-inch slab, almost 12 gallons of water can come through every 24 hours, per 1,000 sq. ft. of slab. Condensation: Concrete conducts heat quite well, so the temperature of the slab is usually fairly close to that of the ground beneath it, around 50-55 degrees F. If the interior air is humid, that moisture will condense into a liquid within the slab and/or flooring system. A thermal break beneath the slab will eliminate this condensation, which is why some underslab barriers include a layer of foam insulation. One way to check if moisture is coming through a slab is to place a piece of clear plastic on the floor, tape the perimeter down tightly, then check after 24 hours to see whether condensation has formed on the underside of the plastic. This is actually an approved ASTM testing method. Of course, this test requires the slab to already be in place. The industry consensus is that underslab vapor barriers should be installed if the slab will be in conditioned space, or if the slab will be covered with a moisture sensitive flooring system. The underslab barrier should be less permeable than the floor covering. Other waterproofing measures will also need to be taken, of course. Proper site drainage, coupled with a footing drain, will relieve hydrostatic pressure. 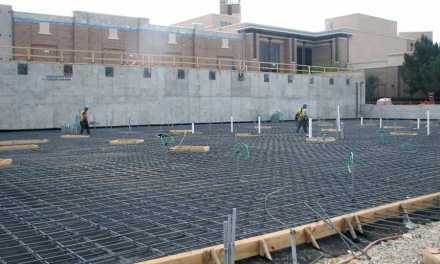 A layer of permeable fill beneath the slab or membrane will eliminate capillary water movement. Literally dozens of companies make underslab moisture barriers. According to Stego, the five most important qualities are permeability, longevity, puncture resistance, ease of installation, and price. Low density polyethylene ( LDPE ) membranes are the most common, least expensive, and are sometimes adequate. Some are cross-laminated, or laminated over asphalt-coated paper for extra performance. The next step up are the high-performance poly membranes. They are made in a variety of colors, thicknesses, and materials, depending on the manufacturer. Many use polyolefin, which is a special high-end polyethelene resin. Perhaps the most common barrier of this type is the bright yellow Stego Wrap, a 15-mil vapor barrier that is reasonably priced and readily available across North America. As with any poly membrane, all joints and seams need to be overlapped six inches and taped. Bret Houck, national marketing manager for Stego, notes that each manufacturer makes a special seaming tape for their particular barrier, and that such tapes are not interchangeable. Perminator, from W.R. Meadows, is another representative product. It’s available in 10 mil and 15 mil thicknesses, and comes in rolls 12 and 15 feet wide and 200 feet long. Like Stego and the other membranes listed by name in this story, it meets ASTM E 1745 Class A Standards. VaporBlock from Raven Industries, is another option. It comes in rolls 10 or 12 feet wide and 150 or 200 feet long, and is available in 6 mil and 10 mil thicknesses. Like most leading brands, Raven sells seaming tape and pipe boot kits to seal around weak points. 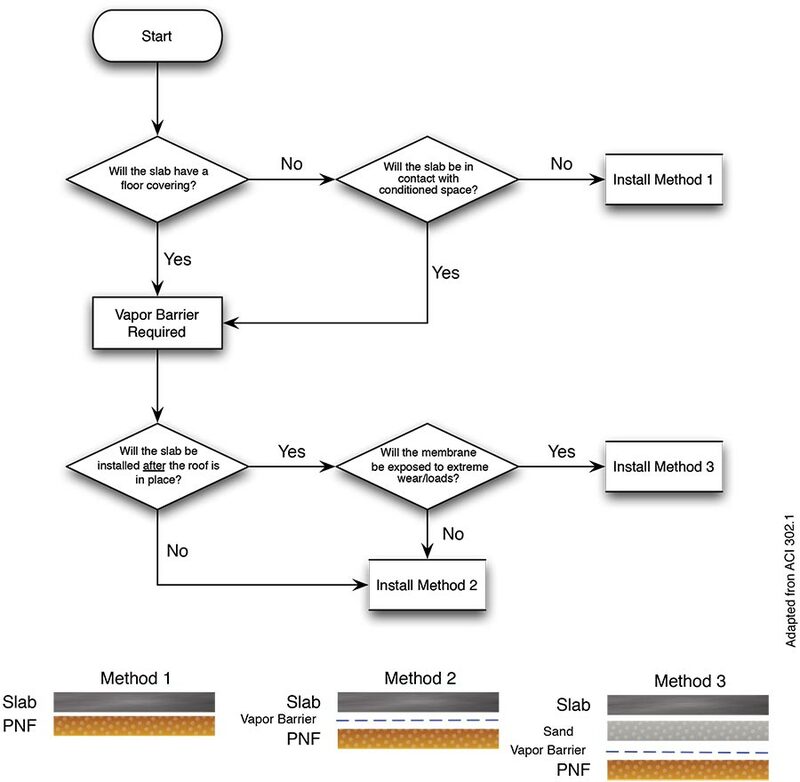 Viper VaporCheck, from Insulation Solutions is yet another option. It’s a bright orange, triple-ply virgin polyethylene membrane. It comes in three mil thicknesses ( 6, 10, and 16) and is virtually impervious to soil gasses and moisture. VaporCheck is specifically designed to resist tears and punctures during construction. The company claims it is the most puncture-resistant membrane on the market, able to support even truck-mounted boom pumps without tearing. 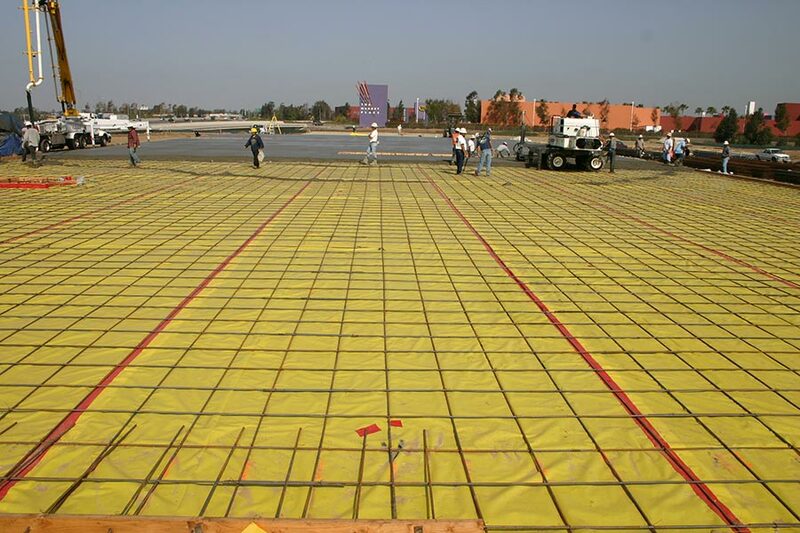 If the membrane will be exposed to heavy foot and vehicle traffic before and during the pour, it may be best to step up to a high density polyethylene (HDPE) membrane. These so-called “air-gap” or dimple membranes are significantly thicker and stiffer than their LDPE counterparts. Cosella Doerken’s Delta- MS, for instance, is 25 mils thick. The three-ply Delta-MS is made from a recycled polyethylene core sandwiched between two sheets of virgin material. 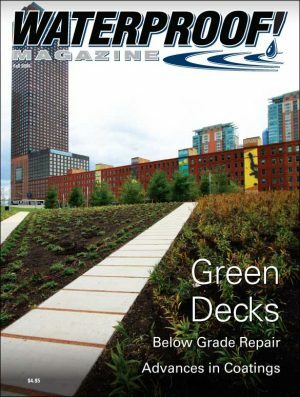 The 60% recycled content helps qualify for LEED points, but the product still has the performance of a virgin material. Similar air gap membranes are marketed by CertainTeed and a few other companies. Any underslab product will have better longevity and resistance to soil chemicals if it are made from virgin materials. Houck, at Stego, points out that ASTM 1745 testing standards do ensure the product’s longevity and that it won’t break down due to exposure with the soil and concrete. 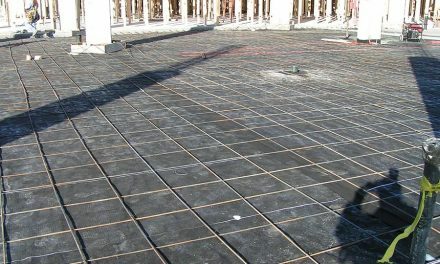 A final type of underslab barrier is the fiber-reinforced LDPE membrane. Anastasi considers them to be among the most durable and high-performance underslab barriers. BiLar, by Drydog Barriers, is one product in this category. It consists of a highly puncture resistant, tightly woven fabric coated with long lasting, low-perm polyolefin resin. 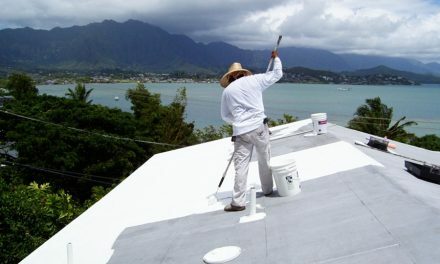 It provides more abrasion and puncture resistance than standard 15 mil poly sheeting. Tricia Barendregt, marketing coordinator at W.R. Meadows, points out that ASTM has two separate vapor retarder specifications with very different performance requirements. ASTM 1745 Class A, B, and C is primarily for plastic film vapor retarders. ASTM 1993 is for “critical areas” and sets the bar 100 times higher than the first standard. 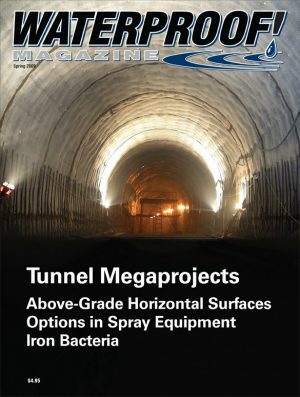 “Be wary of download specifications that pit an ASTM 1745 material against a material that meets the more stringent ASTM 1993 specification,” she says. To meet ASTM 1993, the material must be 150 times more effective at stopping water vapor than an ASTM 1745 material. Lamberti says most commercial jobs call for a minimum 10 mil membrane. Residential jobs often require a less stringent 6 mils. 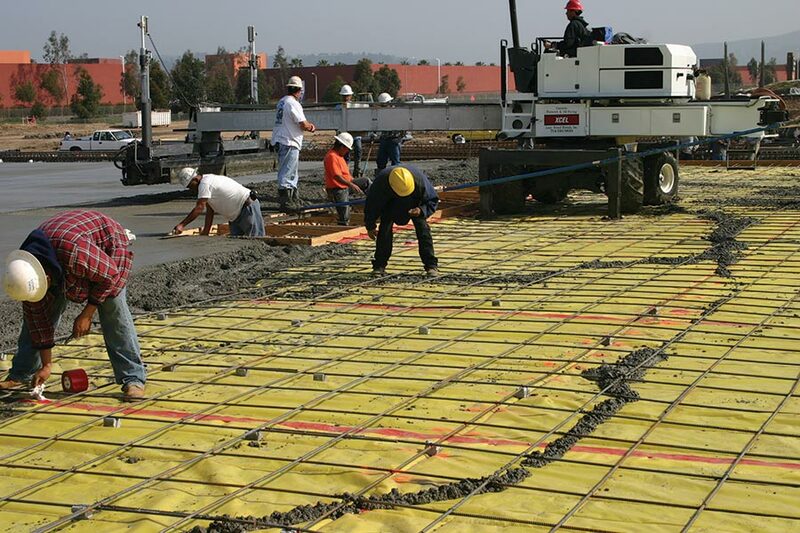 Insulating Barriers: At least three companies market vapor barriers that double as underslab insulation. All of them use a flexible insulating core, sandwiched between two layers of vapor barrier. “Our product combines four functions in a single product, blocking vapor, moisture, thermal, and sound from entering the building from below the slab,” says Juan Garcia, president of The Barrier Insulation. Insulation Solutions makes InsulTarp, which uses a ½ inch insulating core of bubble wrap and closed cell foam. It’s sandwiched between two 6-mil vapor barriers, and is installed the same way as the standard VaporCheck. “What would take a 4-man crew all day can be done by two guys in a couple hours,” says Garcia. The Barrier uses flexible EPS foam for insulation. The standard product is 3/8 inch thick. The BarrierXT is ¾ inch. The moisture barrier is 3 mils thick on both products, although the BarrierXT offers a 10 mil top finish. “If you can keep the concrete closer to the temperature of the air instead of the ground beneath it, you can eliminate condensation,” Radjenovic says. He also points out that underslab insulation is critical for high-performance building envelopes and those that use in-floor radiant heat. Soil Gas Barriers: Soil vapors, such as radon and methane, are a major building concern in some regions of the country. A true underslab vapor barrier, properly installed, can keep these poisonous gasses out of the living space. It requires specialized products and installation. Whether you’re looking for a simple moisture barrier, a vapor barrier, or an all-in-one product that offers a thermal and sound break, the final choice will likely be determined by jobsite conditions, performance requirements, and budget. Installation is fairly similar, regardless of the brand you choose. After the sub-base is leveled and tamped, the product is unrolled in the direction that will minimize the number of seams. Unless the membrane has a self-taping edge like The Barrier, seams will need to be overlapped by at least 6 inches and taped. Air gap membranes like Delta-MS will need to have the dimples interlocked at laps and seams. Most companies recommend taping along the entire length of the seam. All utility and pipe penetrations will need to be sealed tight with tape or specialized pipe boots. “Basically, you want to make sure there’s no view of the ground after it’s installed,” says Tom Stoebner, business development manager at Raven Industries. The material should either carry across footings, pile caps, grade beams and foundations or be turned up to the top of the slab at these elements and sealed. “You’re isolating the ground from the slab as much as possible,” says Lamberti. 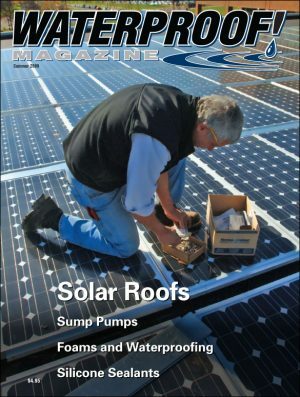 Experts are somewhat split on whether it’s acceptable to install a cushion, or blotter layer, or sand on top of the vapor barrier before the slab is poured. “If you can control the environment, and ensure that moisture will not get into the blotter layer it may be good, especially if the membrane will be subjected to extreme abuse, like having a pump trucks back over the top of it,” says Stoebner. In most cases, though, he recommends against it. The American Concrete Institute (ACI) recommends that slabs with vapor-sensitive coverings should always have the vapor barrier in direct contact with the slab. Other problems include a weaker concrete (due to the cement paste flowing into the blotter layer) and concrete crews wetting the blotter layer prior to the pour to ensure proper hydration. Another common but erroneous practice of finishing crews is to puncture the vapor barrier to encourage bleed water to drain, so they can finish their work more quickly. In summary, an underslab barrier should be installed any time a covering will be installed over the slab, and any time the slab will be in contact with conditioned space. The chart at right, adapted from ACI 302, should serve as a reliable guide. As shown, vapor barriers are made from a range of materials and thicknesses to fit virtually any performance criteria. If the project calls for a true vapor barrier (impermeable to soil gasses) or underslab insulation, special products are on the market that offer significant labor savings on installation. Lastly, according to the most recent test data, barriers are most effective if installed in contact with the slab, with all laps, seams, penetrations and terminations completely sealed. Following these standards will ensure that the building is truly protected against moisture.